Dunn Lambert, L.L.C., in Paramus, New Jersey, was founded by Joseph Dunn and Richard J. Lambert in July, 1998, with the goal of creating a business and commercial law firm for the 21st century. A law firm that serves the needs of businesses should be run like a business. We understand that you expect your vendors and professional service providers to compete on the basis of service, quality, and value. Contact a lawyer by e-mailing or phoning our law offices to schedule a consultation. We are committed to providing our clients professional and personal service. If your problem demands immediate attention, we will deal with it accordingly. At Dunn Lambert, our clients set the expectations. Whenever possible, we will seek and encourage up-front contracts about the level of service that you require, and expect that you will hold us to that contract. Business clients expect technical expertise and skill from their attorneys. We pride ourselves on our knowledge of the law, and our skills as practicing business lawyers. However, quality in legal services means more than technical proficiency. Real quality derives from the ability to discern a client's objectives and to develop and implement a legal strategy that can achieve those objectives, at a reasonable cost. At Dunn Lambert, we believe law firms should show greater sensitivity to the cost of their services. We know that client satisfaction comes from a job well done, at a cost the client can afford. Fees should correspond to the value of the work to the client. A distinctive mark of Dunn Lambert's practice is the wide range of industries that make up our client base. We represent clients in the food industry, manufacturing industry, high-tech companies, independent pharmacies, distributors, insurance agencies, and professionals, among others. Such diversity of experience affords us the knowledge to recommend solutions for your business that are often drawn from the best practices in other industries. 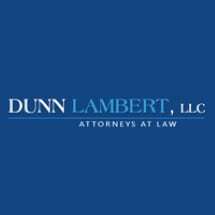 For a prompt response and thoughtful consideration of your legal concerns, contact Dunn Lambert, L.L.C.